Quora is a question-and-answer site with a lofty goal: "To get all of the world's information that isn't already on the Web onto the Web," according to co-founder Charlie Cheever, the former head of Facebook's Connect and Platform engineering teams. "It's true that you can Google a lot of stuff, but some topics are based on experiences," Cheever says. "We're trying to draw that information out so Quora becomes the go-to page for a given topic." 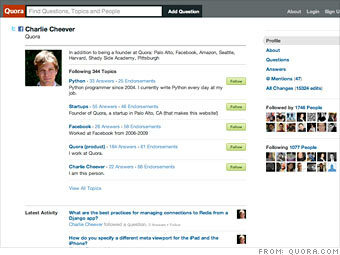 Cheever launched Quora with Adam D'Angelo, who was Facebook's chief technology officer. The site is Wikipedia-esque in that content is created, edited and organized by users. But Quora wants to make all that information highly reliable. Users must post their real names and pictures, along with a short biography. "If Michael Jordan gives an answer to a question about basketball, that means something really different from someone who has never played the game," Quora's website explains. The blog GigaOM says Quora is working on ways to showcase high-quality contributions, organize topics and arrange users' news feeds based on how long it's been since they logged onto the site. "That's a different approach from the typical user-generated site -- say, Facebook -- which is designed to foster maximum participation by users, without placing any sort of value judgment on what they do," GigaOM notes. The site launched in private beta testing in January, with many tech insiders providing answers to posted questions. Quora's doors opened to the public in June, and TechCrunch loves it so far: "There's a magic to Quora that has captured Silicon Valley's imagination. Something about the quality of the people and the content. Real discussions break out on Quora all the time."  The Facebook boys: Where are they now?